The summer before my senior year in high school, I tried to read Wuthering Heights. I think I read the whole thing, but it was a struggle. The novel was too dark and complex for me at the time. During the school year, a classmate recommended Jane Eyre. That I devoured. I was Jane. All of us plain, quiet girls were, and we loved dark and troubled men (or boys, at the time) like Mr. Rochester. I read the novel several times, and later her biography (not Elizabeth Gaskell’s). I wrote about Jane Eyre for AP English (and got an A although I thought I was bullshitting). In college I watched the miniseries version with Timothy Dalton (or tried to, I wasn’t into it) and I read Wide, Sargasso Sea. So when my friend and I popped into the Morgan Library over the weekend as part of the Smithsonian’s free museum day, I was over-the-moon to see their exhibit on Charlotte Bronte. The exhibit marks the 200th anniversary Charlotte’s birth. The Bronte children were born in Yorkshire to an Irish immigrant father and English mother. Charlotte had two older sisters, Maria and Elizabeth, who both died of tuberculosis at ages 11 and 10, respectively, and within a month of each other. Just a few years earlier, their mother died of uterine cancer. Left in the family besides Charlotte were her father Patrick, younger sisters Emily and Anne, younger brother Branwell, and their aunt Elizabeth who helped raise them after her younger sister’s untimely death. In the end, patriarch Patrick was the only Bronte to live to old age, outliving all of his children. Branwell and Emily died the same year, at 31 and 30, respectively, and, like their sisters Maria and Elizabeth, within months of each other and rom tuberculosis. Branwell was also an addict, and legend says that his failed romance with a married woman only worsened his condition. Anne died the following year at 29, also of tuberculosis, and Charlotte, six years later at 38, from complications of pregnancy although it’s speculated she might have also had typhus. The exhibit focuses less on the tragic side of the family and more on the imaginative and whimsical. Included are the miniature replicas of books and magazines she and her siblings created for their toy soldiers, her teenage poems (one of which she bragged took her only an hour to write), her drawings and paintings, and of course her famous works. My friend and I were fascinated by the teeny-tiny handwriting all the Bronte siblings used. It’s said that they started out writing that way to match the size of their toy soldiers, but then it became a sort of secret code. I had heard of her “miniscule handwriting” before, but I hadn’t realized it was that miniscule. The Morgan helpfully offers magnifying glasses so you can actually read it although they didn’t really help my 40+ year old eyes. — she had teeny-tiny hands that made writing so small easier. 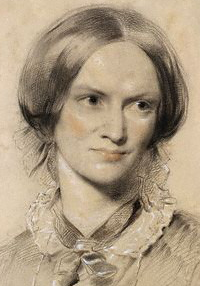 In addition to her artworks, there’s the famous family portrait by Branwell Bronte. That’s, from left to right, Anne, Emily and Charlotte. The portrait is usually housed at the National Portrait Gallery so I must have seen it during my two-week stay in London several years ago, but I don’t remember. So seeing it in real life for what felt like the first time made me swoony. Branwell had originally included himself in the portrait, but then painted himself out because he didn’t want to “clutter” it. Now as the painting has gotten older, you can see the “ghost” of Branwell between Emily and Charlotte. The exhibit’s piece de resistance is a portion of Charlotte’s original handwritten manuscript of Jane Eyre (written in regular size by the way). This is usually at the British Library so like the Bronte portrait, I must have seen it before, but again I don’t remember so it felt new and just as swoon-worthy. Of course I wish I could have taken a picture of it, but, understandably, they don’t allow pictures. You’ll have to go and see it for yourself. The exhibit is open through January 2.